Come and discover why NLP is so popular with millions of people all over the world. This Introduction to NLP sets you on a journey of discovery. You are introduced to NLP as a set of ‘how to’ skills that range from powerful communication and people management skills, to changing unwanted feelings and behaviours, enhancing personal relationships, overcoming past obstacles and creating clear future goals. And you can use these skills in almost all areas of your life including business, education, social work, counselling, selling, training, parenting, sports, coaching or consulting. Participants often say that learning these techniques are the best investment they have ever made. So come along and see for yourself why NLP is so popular with millions of people across the world. 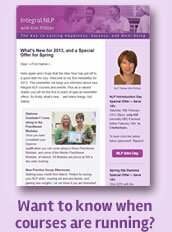 The Introduction to NLP gives you the opportunity to dip your toe in and see if NLP is for you. The Introduction counts towards the NLP Diploma if you decide to progress further. You can take the courses with or without accreditation. Either way all NLP courses start with the NLP Introduction. how we can gain insights into others people’s filters to increase our understanding of their behaviour and respond accordingly. This Introduction to Neuro-Linguistic Programming course is delivered in a relaxed environment and is designed to encourage us to be curious about why and how we do the things we do. A variety of learning techniques are used to ensure that you get the most from your training. These include special ‘how to’ demonstrations, small group exercises, step-by-step coaching, diagnostic sessions, practical skill-building work, discussion forums, plus question and answer sessions. The group size is deliberately limited to 12 participants to ensure that you receive personal attention and direct access to Kim. So please book early to ensure your place. The Introduction to NLP runs either as a one-day course (7 hours), over a full weekend (15 hours) or over three mornings/afternoons (12-15 hours) as advertised. The weekend course and the three mornings/afternoons are longer and cover extra material. £80 early-bird for the one-day course if booked at least two weeks in advance, otherwise £100. There is a 15% discount if two or more book together. £120 or £100 each for multiple bookings if booked at least two weeks in advance. Self-financing - £200 or £160 if paid two weeks in advance. Employer-sponsored - £240 or £200 each for multiple bookings paid in advance including manual. There is an extra 15 hours of training required costing a further £200 self-financing (£160 early-bird) or £240 employer-sponsored (£200 multiple bookings) for those taking full Diploma accreditation. Please email Kim for dates and venues. NEW: Three Mornings or Afternoons (times as advertised) £45 each session (morning or afternoon) including manual. Cost for certification extra for those continuing to take the full Diploma over a further three sessions. Please contact Kim for further information. Progress to take the accredited: NLP DIPLOMA COURSE.